Set just south of the Caucasus Mountains, rural South Ossetia has beautiful scenery and mountain ranges. 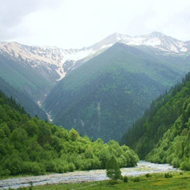 The image above is from the Dzhava District in South Ossetia. The land is extremely fertile. South Ossetian farmers cultivate cotton and grains as well as fruits such as grapes and apples, among other crops. Meals have traditionaly been a very important part of the Ossetian culture with elaborate rules for celebratory meals. Ossetian shish kebabs or shashlik are very well-known and cooked with either veal or lamb. Dzykka is a traditional Ossetian dish is cooked with cream and flour. 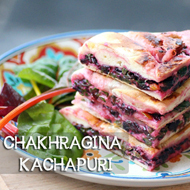 Chakhragina is very popular and made with fresh Ossetian cheese. Cheese has been a staple in the Ossetian diet for hundreds of years. Recipe for Ossetian ‘feta’ cheese. Vaso Abayev (also Vasily Abaev) was an internationally renown linguist who specialized in Ossetian linguistics. He was also a scholar of Ossetian literature and wrote several articles on Zoroastrianism. 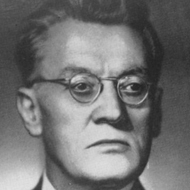 Abayev’s most famous work was the Etymological Dictionary of Ossetian Language, which was published in four volumes between over three decades (1959-1989). Remarkably, Abeyev lived through the entire 20th century—he was born in 1900 and died in 2001. Tskhinvali is the capital of South Ossetia and the largest city in the region. It is known for several major landmarks, including the main government building, which is a large neoclassical Italianate building (a type of Classical architecture), a statue of Kosta Khetagurov, an Ossetian poet, a statue of Vaso Abayev, a famous Ossetian linguist, and a monument to the victims of the 1991-1992 Georgian-Ossetian conflict. The war has done considerable damage to the city and its landmarks. 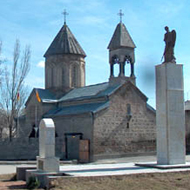 The monument to the victims of the conflict was completely destroyed by Georgian forces in August 2008.